I’m happy to report that the bees made it through the storm. 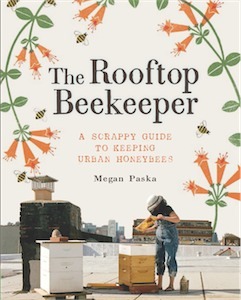 I had my doubts about the level of stability of the hives on my roof, but they toughed it out without toppling and the bees are out flying in this gorgeous weather as I type. I noticed many of the returning foragers are coming in with pollen baskets loaded with what appears to be Knapweed pollen. TIP: One of the things I encourage when preparing for a storm is to NOT OPEN the hive for an inspection before it hits. The bees propolize the supers together, making them more stable. If you break the seal on a hive, you weaken it. If you know bad weather is coming, hold off on inspections until after it passes. Still no word from Newton Farm. That area (Catskills) has been subject to very destructive flooding and power and phone lines seem to be down in most places in Greene County. Worried about my friends, chickens and bees. Ghost, Salad and Hazel are up there too. Fingers crossed that all of the critters great and small have triumphed over this scary weather. Back in BK, the chickens ended up staying indoors until the wind mellowed out. The coop was tarped and weighed down but we weren’t sure what to expect so we brought the little ladies in and let them cozy up in a dog kennel. They have been out and about all morning eating worms and botched noodles and stretching their wings. One of them even got so excited to be free that she laid an egg right there on the ground. While out there with the hens, I cleaned up the debris (not a single plant lost) and dumped in our compost pile. Now it’s nice and full of green leaves and chicken-turd-covered straw. YUM! At least the worms will like it! That’s pretty much all that is going on here. I hope you all experienced very little damage from the storm. Please spread the word on the folks in the Catskills, Hudson Valley and CT. They are having a pretty rough time of it right now and need support.